Fine Gael TD Noel Rock has become embroiled in a war of words with Tánaiste Simon Coveney over John Delaney’s €100,000 bridging loan to the Football Association of Ireland (FAI). After the loan emerged Mr Rock said Mr Delaney’s performance as the head of Irish football is not living up to his "Rolls Royce salary" and insisted he should resign from the €360,000 a year position. Mr Rock - a member of the sport committee - has argued that the issue of the loan is "overshadowing" the on-field performance of the Irish football team. Speaking on Independent.ie’s Floating Voter podcast, he said: "I think it’s time for John Delaney to step aside." However, Mr Coveney slapped down Mr Rock’s comments saying that Fine Gael’s position is that Mr Delaney should be allowed appear before TDs and Senators to be quizzed on the issue. Speaking before the Fine Gael national Conference in Wexford, the Tánaiste said it was "far too early" to discuss Mr Delaney’s position. "Noel Rock is someone who is not afraid to give straight answers to straight questions," he said. "He has made a comment in relation to this issue. The party's position on this issue is that John Delaney should be allowed go before the committee, take questions and answer them and the issue will be taken from there," he added. "It is far too early to make that decision." Justice Minister Charlie Flanagan was also reportedly critical of Mr Rock’s comments. The FAI declined to respond to Mr Rock’s remarks. In a statement sent to Independent.ie, Mr Rock has now hit back at the Fine Gael deputy leader saying he stands over his comment and insisted "there are serious questions here for Mr. Delaney to answer." "The criticism here belongs to Mr Delaney, who attempted a failed injunction against a newspaper while doing their job, and reporting on an undeclared loan from Mr Delaney to the FAI," he said. "Sport Ireland weren’t satisfied about this loan, I’m not either, and I’m surprised that the Ministers are quicker to criticise me than Mr Delaney in this scenario. "Sporting organisations shouldn’t be personal fiefdoms. I thought the political class had learned lessons from the Pat Hickey affair," he added. The FAI and Mr Delaney are due to answer questions on the matter before the Joint Oireachtas Committee on Sport next month. Mr Delaney gave a €100,000 bridging loan to the association in April 2017. The FAI has said the loan was repaid in full two months later. 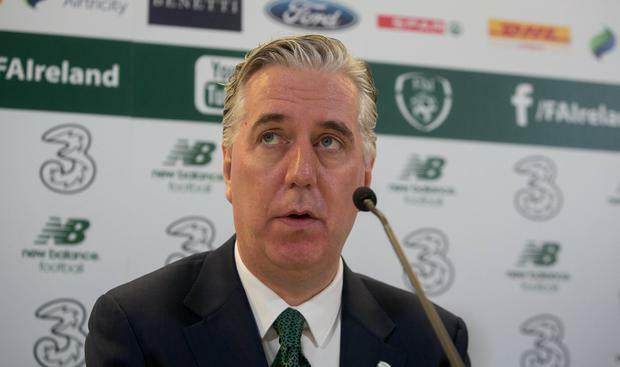 Earlier this week the FAI said it has been undertaking a full review of its executive governance and senior management structures. A statement said: "This review will be completed and all actions approved by early April when a full press conference will be held to reveal all outcomes." It also said: "In the meantime, the Association reiterates that the bridging loan was made in the best interests of the FAI in 2017 when it experienced a short-term cash flow issue". The FAI board was "kept fully informed" in relation to the matter "at all times” the statement said. Maeve Sheehan The political republican group that issued a statement absolving the "IRA volunteer" who shot Lyra McKee marched on the streets of Dublin within 48 hours of her murder. Philip Ryan Rural Affairs Minister Michael Ring has unleashed a ferocious attack on former Kerry footballer Pat Spillane after his appearance on RTE's Late Late Show. Philip Ryan Two new opinion polls have shown conflicting levels of support for the country’s two main political parties.